I hope some of my fellow surf anglers got out these past two days to take advantage of the whiting, croaker, and pompano bite that has been happening along our local beaches. Tomorrow, Friday, looks like that is going to be the last day to hit the surf until next week as this next weather system will be upon us on Saturday afternoon. The beaches along the south end of Hutchinson Island, Tiger Shores, Stuart, and Santa Lucea have been holding the best water, as the northern end spots like Middle Cove have been very off color. I fished at Stuart Beach on Wednesday afternoon and put together a decent catch of whiting, croaker, and a couple of keeper pompano. The most amazing part of Wednesday's fishing was the number of pompano that I released before catching two keepers. 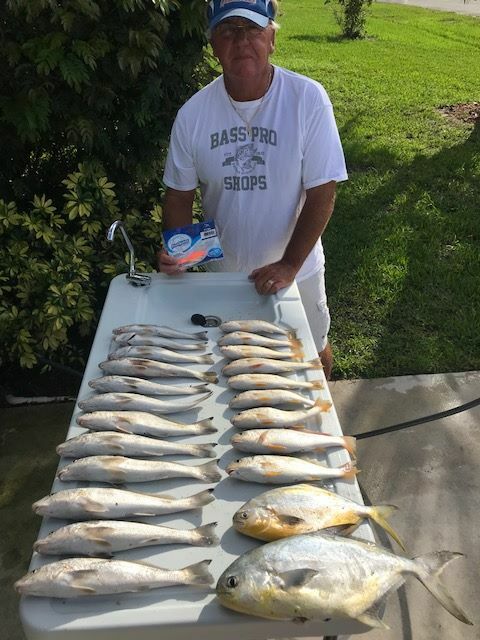 I probably released 20 to 25 before I caught my cooler fish, and a report from one of my commercial pompano friends was the same story today at Tiger Shores. He caught at least 20, but only four of those were of legal size. I want to remind everyone that targeting the hours around high tide is the key to putting together a nice catch of the whiting and croaker. Orange Clam and Pink Shrimp Fishbites were the best baits again along with some small pices of fresh shrimp. Hopefully this next storm gets out of here by early next week so we can get back to this great action.